Anticipation is one of the constants of my book blogging life. When I began blogging lo, these many years ago (okay, fine, five and a half years! ), I looked around to see what the community was doing. A weekly event called Waiting on Wednesday (WoW) drew my attention, and I’ve been participating on and off ever since. It’s all about finding books that aren’t released yet and highlighting them while you wait for the release date to come around. Since then, I’ve been much more aware of what books are coming, when, and whether I’m interested or not. A year and a half ago when I saw Francesca Lia Block's Love in the Time of Global Warming cover art and heard Greek mythology, retelling, and post-apocalyptic in combination, I coveted it. Now, after no less than three library fines and several ultimatums to myself (I’ll finish it by Tuesday! ), I’ve finally read it. A stunning reimagining of Homer's Odyssey set in post-apocalyptic Los Angeles, written by a master storyteller. Pen lives in a post-apocalyptic Los Angeles. Two months after an earthquake opened a huge gash in the earth, and the sea came rushing up to her house, she’s still hiding from the broken world outside, surviving on stockpiled canned goods. She hasn’t seen her family since the disaster, and fears the worst... When her fragile denial and ‘peace’ is broken, Pen must venture out into a changed landscape. She will see unbelievable things, meet mythical creatures, mine her strengths, and adopt a dangerous quest, all in the name of love. Whether or not she comes home again will be a matter of will, of luck, of the strengths of her companions, and a bit of magic. My summary above makes this book sound rather concrete! I’m actually proud that I could distill it down from concepts and allusions and magical realism into something that makes linear sense. Warning: Love in the Time of Global Warming does not make much sense, in a traditional plot sort of way. Yes, it is about a journey that mirrors Odysseus’ in The Odyssey. But. This version of the story is full of flashbacks and foresight to other times, musings on art and its importance even in a world where survival is paramount, queer identity, being good to the earth, and possible gifts/powers that have sprung up amid the desolation. All of those things overwhelm the ‘journey’ thread, making the book seem more like a series of related vignettes. The effect is fable-ish. Pen herself is a confused, grieving teen with a bent toward the fantastic. Her mind loops around a blend of memory, religion, art, symbolism, and story, and in the midst of it all Pen finds pieces of herself that weren’t evident in life ‘Before.’ While she occupies the post of narrator, she’s not always the central figure in the tale. I found myself frustrated in the extreme with this Pen-narrated, unfocused storytelling. Experiences had a vague quality to them, so even though the end of the world sounded terrible, it never made it into my mind’s eye. In addition, the themes of sexuality, gender, and addiction were never fully explored. I could tell that the book was making statements, but I felt as though I was being asked to unravel a muddle that could have been made explicit. Feeling stupid while reading makes me grumpy, folks. In the end, I have found two ways to describe this book: one is kind, the other one… honest. Feel free to take your pick. 1) Love in the Time of Global Warming is an elliptical, fantastical tale that takes on the theme of identity and claims art and love above all. 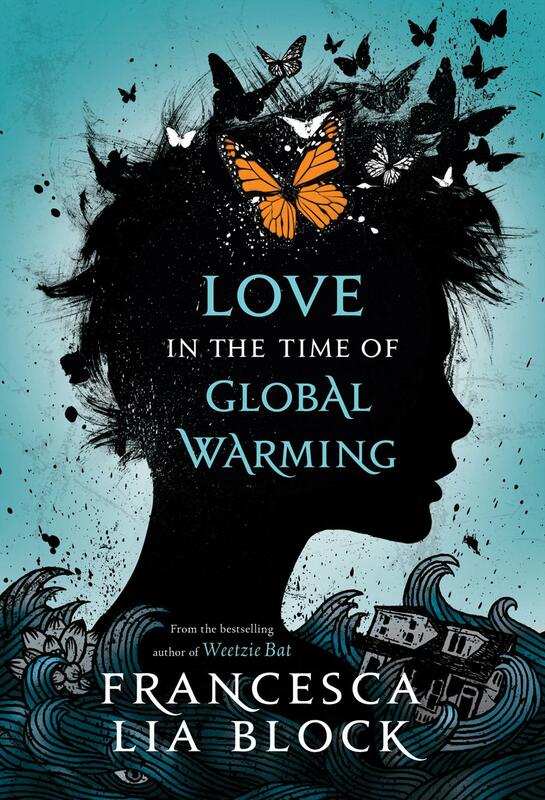 2) Love in the Time of Global Warming is a book that tries very hard to be meaningful, but in the end feels like reading an extended nightmare or drug-addled dream. As I said… take your pick. Recommended for: readers who like trippy fantasy and sci-fi as long as it is pretty (and for whom coherency is not a number one priority). You know, I've never participated in Waiting on Wednesday, but now that I'm not so involved in publishing I think it would be a good way to keep up with the new releases that are coming out that I'm excited about! A lot of times, I read about a new release and then completely forget about it once it is actually out in the world. Thank you for the reminder! I have been meaning to read Francesca Lia Block for so long, so many bloggers I know love her books. Even though it seems you're really of two minds about this book, she's still an author I'd really like to explore! I absolutely loved it, but I knew to expect beautiful but trippy incoherence when I picked up a Francesca Lia Block book. I really loved the characters, mostly. But I think most people who like Block read her as a kid and sort of got her style in their bones. Francesca Lia Block is an author in general for whom coherence does not seem to be a number-one priority. It always leaves me feeling a little unmoored, when I read one of her books. That's not an absolute negative, but it does keep me from truly loving anything I've read by her so far.